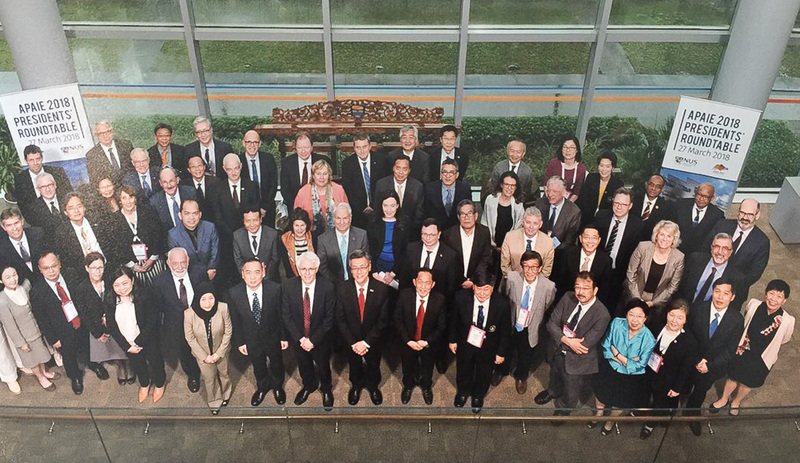 (VNF) – Upgrading the relations between the Vietnam National University (VNU) and National University of Singapore into comprehensive strategic partnerships was discussed by leaders of two sides in the Asia-Pacific Association for International Education (APAIE) annual conference and exhibition held in Singapore from March 25-30. The event aimed to bring together policy makers, managers and specialists in education worldwide and especially the Asia-Pacific, to create cooperation opportunities and exchange on the new trends of international education development. At the conference, Vice Director of the VNU Nguyen Hong Son has talked about VNU’s initiatives on building a university for the future, fostering lifelong learning and enhance cooperation among uni. Delegates from Hanoi National University also joined bilateral meeting to discuss cooperation prospects with potential partners, including Indiana University, University of Arizona (US), Sussex University (UK), Paris Institute of Political Studies (France), among others. Specially, on the occasion, VNU and the National University of Singapore discussed on upgrading the relations to strategic comprehensive partnerships to fully tap at the potentials of the two big universities in the region./.